The press wrote on Ms Nam's outstanding debut as MADAMA BUTTERFLY at the Saarbrücken State Theatre. Subsequently, the young Korean soprano debuted with great success as ELISABETTA in Don Carlo at the Art Center Seoul, where she previously had succeeded with LUCIA DI LAMMERMOOR, ADINA, AGATHE, MIMI , PAMINA and VIOLETTA VALÉRY. Extraordinary success she earned as LIU at the Mannheim National Theatre, as TOSCA at the Bremen Theatre, as CIO-CIO-SAN at the Magdeburg Theatre and as TATIANA at the Saarbrucken State Theatre. Both, her engagements at the Saarbrucken State Theatre and at the Bremen Theatre were re-engagements. The soprano gave her debut as DONNA ANNA at the Munich Prince Regent Theatre and as LAURETTA at the Braunschweig State Theatre . 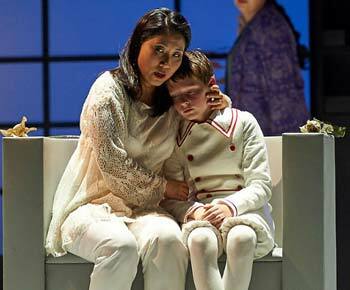 In Italy Ms Nam made her debut at the Teatro Asioli di Corregio and as MICAELA at the Teatro dell'Opera di Sanremo. She attracted international attention in an Anniversary Concert on the occasion of the 50th stage anniversary of Mirella Freni at the Teatro communale di Modena, whereupon she was immediately engaged by Maestro Michael Jurowski for the opening concert with the Orchestra of the Arena di Verona Foundation at the Teatro Filarmonico di Verona. At the Teatro del Giglio in Lucca her debut as MIMI under the musical direction of Maestro Marzio Conti, was so successful that she was engaged to sing this very role the following season at the Teatro Communale di Bolzano, the Teatro ad Adria, the Teatro Goldoni di Livorno and the Teatro Verdi di Pisa. In this last opera house, the singer also interpreted the title part in a concertante performance of SUOR ANGELICA. Ms Nam first absolved singing studies at the National University of Seoul, before completing them with Helmut Deutsch at the Conservatory of Music And Theatre in Munich and with Mirella Freni and Maria Chiara in Italy. Besides, she took master classes with Josef Loibl and Nicola Martinucci. Hye Won Nam wo the First Prize of the Mirella Freni »L'Opera Italiana«-Competition, the First Prize of the International »Francesco Maria Martini« Competition in Lignano Sabbiadoro and is a prizewinner of the competitions »Francesco Vinas« in Barcelona, »Competizione dell'Opera« in Dresden and the IVC in the Netherlands. In the season 2015/16 Hye Won Nam portrayed CHO-CHO-SAN at the Wuppertal Theatre and the Jykse Opera in Denmark. At the Seoul Art Center she made her debut as AMELIA in 'Un ballo in maschera' performing with such renowned collegues as Franceso Meli, Massimilliano Pisapia and Renato Devid Cecconi. The standing ovations at the end of the premiere were mainly for Hye Won Han as a sensational Butterfly. It is not just her looks that make the Korean soprano Hye Won Nam ideal for the title role. With her dramatic soprano voice she not only succeeds in dealing with the spiritedly playing Wuppertal Symphony Orchestra under the musical direction of Ulrich Windfuhr. Absolutely secure in the high registers and with an intense playing she sings her big aria in the second act "Un bel di vedremo" and her closing aria "Tu, tu, piccolo iddio". The Korean Hye Won Nam, who was engaged for the role of Butterfly portrays the rdical Butterfly with every inch of her body: concentrated, impressive and powerful...She gives the character tragical greatness, she is the undisputable star of the evening. With Hye Won Nam (Madama Butterfly) a star is born. The Korean soprano enchants the spoiled Saarland audience. Gentle piani, followed by extremely expressive tones, dramatical, a voice without pathos or mawkishness. A stagefilling presence. Her body language and her voice have a breathtaking congruence. Gracefulness and lightness, then again hassling despair and dark bitterness. A voice that lingers deep in your soul. A beautiful physical appearance, which makes you understand Pinkerton's desire. Hye Won Nam impressively plays the charming and at the same time naive Madama Butterfly. With her powerful voice and her delicate movements she reminds one of a fragile butterfly, clinging to its love.